Recently, I rebuilt my three-year-old computer with a Kingston 32 GB Solid State Drive (SSD) and installed Windows 7 Home Premium edition on it. After installing my favorite applications and games I had just 6 GB of free space left on the disk. So, to gain some disk space I disabled the useful hibernation feature as well. Three days back, I was already late for my office and so wanted to shut down my PC as quickly as possible, before stepping out of my home office. But when I opened the Start menu to click Shut down button (I usually do it pressing Windows key followed by right arrow and then pressing enter key), I saw the unusual shut down icon that appears when Windows has downloaded updates and wants to install and configure them before shutting down the PC. Every Windows user faces this kind of situation once in a while. 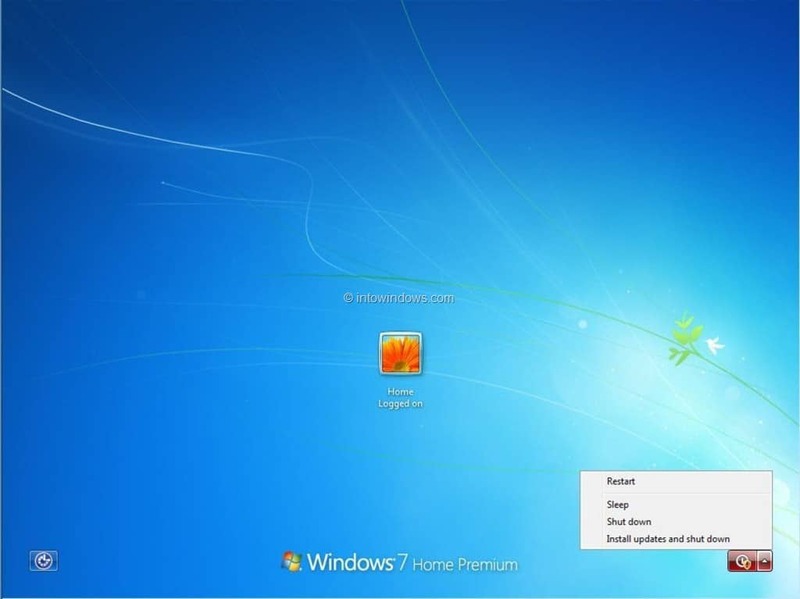 Though users who have enabled hibernation feature on Windows 7 can simply choose to hibernate in such situations, other users can simply force Windows to shutdown without installing updates during the current shutdown. 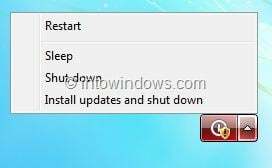 If you are in a hurry and don’t want Windows to install and configure updates during the current shutdown process, you can follow the steps given below to prevent Windows from installing and configuring updates during this shutdown. Step 1: Before getting started, make sure that you have closed all running applications and saved your work. Step 2: If the update icon is being displayed on the Shutdown button (which indications that Windows is going to install updates before shutting down the PC) on the Start menu power section, simply Lock off your user account. To do this, choose Log off option under Start menu power options. You should now see the logon screen. Step 3: Near the lower right-corner of the screen, you will see Restart, Sleep, Hibernate (if enabled), Shutdown, Install updates and shutdown options. 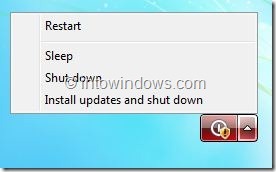 Click on the Shutdown button (and don’t click on Install updates and shutdown) button to shutdown the PC without installing updates. If Restart, Sleep, Hibernate, Shutdown and Install updates and shutdown options are not appearing, simply click Switch User button to see power options. I just pull the plug…after saving my work. Skips the updates and shuts down every time.